I can imagine this bracelet on Cleopatra’s wrist sans the snake coiled around her arms. 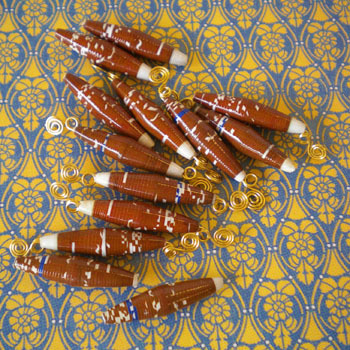 I just love the chocolate brown color of the beads which makes me think of hot chocolate with marshmallows on top, but Kayla wants to call it Tootsie Rolls. 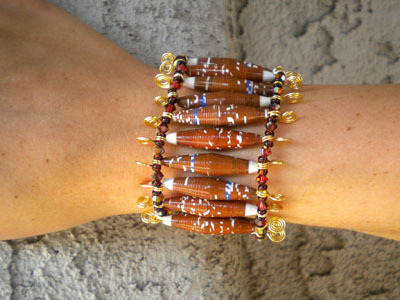 The paper bead tube measures 1 1/4 inch long and 1/4 inch wide, this makes this cuff big and bold fit for a queen! 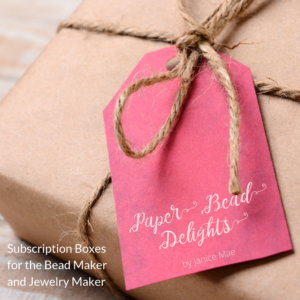 I took a 20 gauge craft wire and coiled the ends to make it look like swirls and scrolls pretty much like the pattern on this scrap book paper. 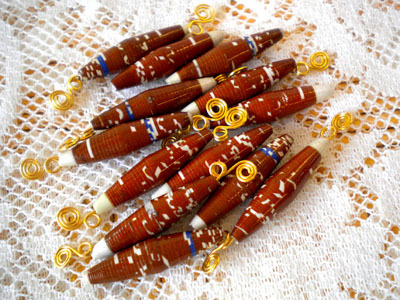 I took an elastic and put it through the loops at the ends of the paper bead and tied a square knot. In between are catheral 4 mm bicone swarovski crystals for sparkle! Or, you could just do simple loops to put your elastic through. I love the wire coils – really classy. And big, bold bracelets are my favorite jewelry accesory. 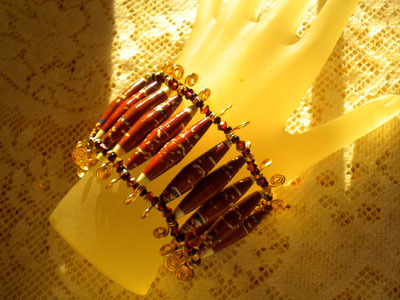 This bracelet is very nice and cool, it realy reminds on Cleopatra.